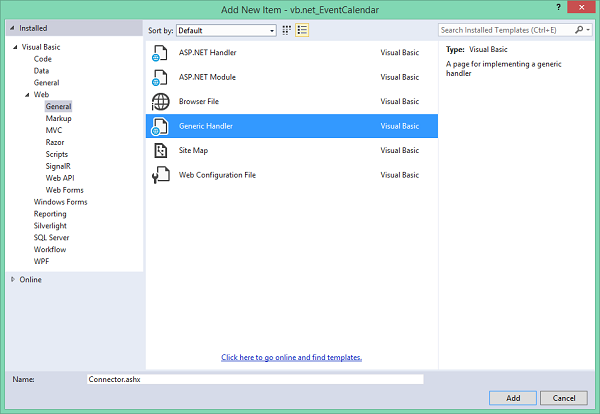 In this article we will show you the easiest way to bind VB.NET calendar created with DHTMLX Scheduler with the Database in an application using Web Forms. We'll also show how the options for the Resource View and the details form Select can be loaded from the server. 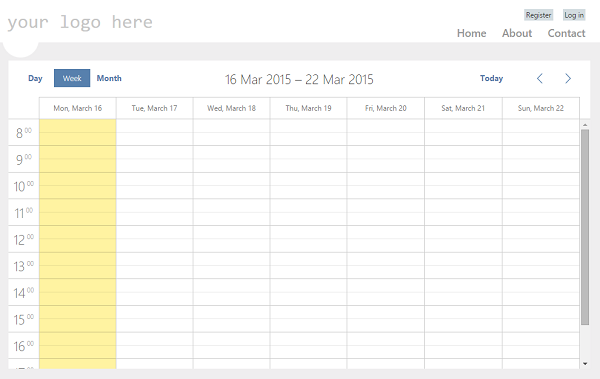 The component page can be found here. The demo will use a free and open source dhtmlxConnector library that takes on CRUD operations without a need to write CRUD methods manually. In the left bar select Visual Basic - Web. 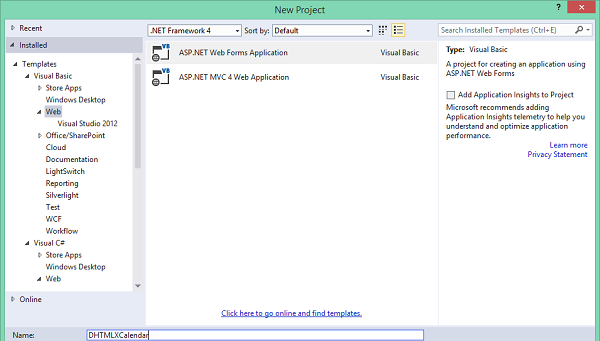 Then select ASP.NET Web Forms Application and name it DHTMLXCalendar. 2. You also can download it via Manage Packages. 3. Download dhtmlxConnector and add the librarydhtmlxConnector.NET.dll from the codebase/folder to the created project. 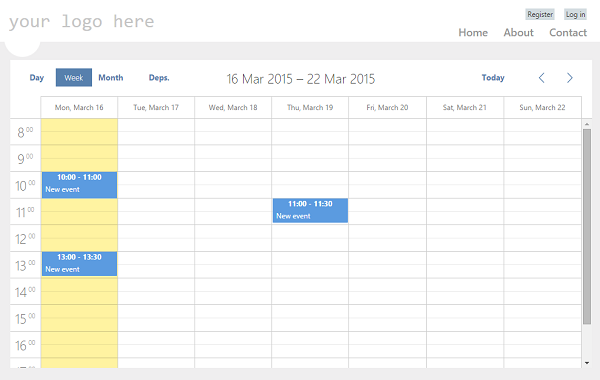 In this section we will create a new database that contains two tables named ‘Events’ and ‘Departments’. Note. EventId of the 'Events' and Id of the 'Department' tables should be identical. Otherwise you cannot create new events. In other tutorials you create Model Classes which represent a table and properties in the columns of this tables. Then you have to implement the CRUD logic. With DHTMLXConnector you can skip these steps because DHTMLXConnector undertakes the tasks. This component will automatically generate the required queries for selecting, updating, inserting or deleting data. All you have to do is to initialize the connector. Other content from this page can be removed. 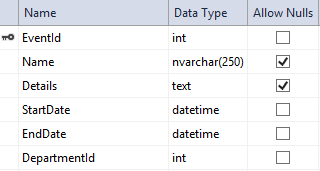 dhtmlxDatabaseAdapterType.SqlServer2005 - database adapter type or adapter. Connector can be used for various database engines like Oracle, MySQL, Postgres and etc. This option specifies MSSQL server and work for all versions of SQL server. We've specified that the scheduler should load data from the connector and send updates from the client there as well .